At the approach of a canoe, the wolverine tears into the woods, its claws spitting mud. Seconds later, ravens scatter from what resembles two branches reaching from a driftwood log. After the animals flee the Fortymile River gravel bar, the driftwood turns into chewed velvet antlers the size of a folding chair. A fleshy backbone ropes from a skull, extending to rib fragments and a blade of hipbone, its sockets empty. A few tufts of hide lay amid rocks, but the rest of the caribou — so fresh it barely smells — has vanished. Seven wolves, a pack that includes two parents and two pups born in early June, spot a young caribou limping toward the Fortymile River. As the caribou, its right front leg injured in a fall, enters the water to swim across, the pack holds. When the caribou emerges dripping on their side of the river, the wolves move. The pack rushes from downwind, surprising the chocolate-brown bull. With practiced teamwork, the wolves drag down the caribou. The animal gasps its last breath and falls on round rocks powdered with river silt. There, the recycling of a large mammal begins. Using their teeth with astonishing force, the wolves rip open the caribou’s hide from the puncture wounds on its throat. The wolves tug at hair, flesh and savored internal organs. Crouching at the caribou like pigs at a teat, they gulp down wet, warm chunks. The seven creatures will share most of the caribou, one of many meals that help sustain 100-pound animals in hungry country. The wolves will not get it all. A healthy black bear with a cinnamon coat wanders in, scattering the now sluggish wolves that retreat and look on a few body lengths away. The bear yanks at the carcass until it pops a hindquarter from the hip socket. After a bit of surgical cutting with its teeth to release the 50-pound prize, the bear drags it into the spruce. The wolves return to the kill, scattering ravens that spotted the scene as they circled overhead. The ravens also sniffed a plume of stink. 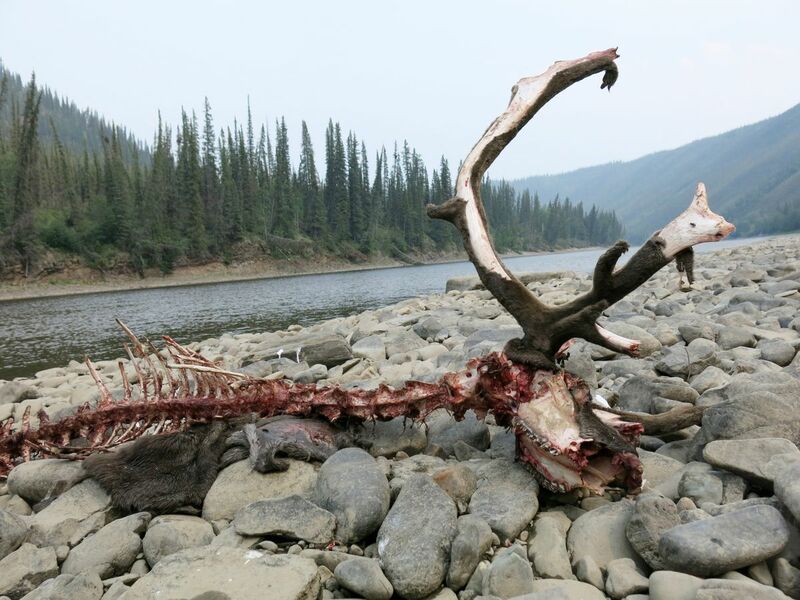 When the caribou died, communities of microbes on its body and within its gastrointestinal tract did not. They start the decomposition of the flesh, as do resident bacteria. Beginning the process of putrefaction, the microscopic bugs emit smelly byproducts, including ammonia, hydrogen sulfide and ethanethiol, a gas so detectable by humans we add it to propane. The ravens, he points out in his book “Life Everlasting; the Animal Way of Death,” will not only eat what they find, but will fly off and hide scraps for later. Other animals will sniff out those caches and taste a caribou they never saw. The revolting scents wafting from the body pull blue-bodied blowflies from 5 miles downstream. According to Derek Sikes, entomology curator at the University of Alaska Museum of the North, the two flies most likely to arrive first are Cynomya cadaverina and Calliphora vomitoria. Each fly lays more than 100 eggs on the still-warm carcass. Within eight hours, those eggs are maggots, which feed to satiation before worming off into the dirt. There, they will morph into the next generation. Northern carrion beetles are the second group of insects to the caribou, arriving soon after the flies. They convert the animal to new beetles by eating it (and the fly larvae known as maggots), laying eggs on it and mating at the site. When the carcass dries, the maggots and larger beetles move on, making way for the dermestids, smaller beetles of the type museum specialists use to clean bones. When the dermestids are done, rodents will tote off some of the remaining chewables. Soon after, the river will rise, cleansing the site of the drama. As for the caribou, its death enabled many more lives than it produced during its few years of clicking across the tundra.